President Ashraf Ghani announced in February 2018 that the Afghan government is willing to hold peace talks with the Taliban without preconditions if the Taliban would stop committing acts of terror and accept the Afghan constitution.81 Following this development, U.S. Defense Secretary James Mattis made a surprise visit to Kabul in mid-March 2018 and said “We do look toward a victory in Afghanistan. . . . Not a military victory—the victory will be a political reconciliation.” Secretary Mattis explained that the goal of the United States is to strengthen the Afghan security forces enough to convince the insurgents that they cannot win on the battlefield, driving them to choose reconciliation. Although the Government of National Unity (GNU) remains relatively stable, it continues to face political, ethnic, and tribal challenges. If serious divisions emerge, they may threaten the capability and coherence of the government. Ethnic minorities remain concerned that President Ghani is excluding them from government and consolidating power around the Pashtun elite. This concern has grown with the inclusion of the Pashtun-dominated Hezb-e Islami Gulbuddin (HIG) militant group into the government. The United States is supporting a sustainable transition to Afghan leadership by partnering with the Afghans to build capacity, generate economic growth in support of fiscal sustainability, and foster efficiency between the national and sub-national governments. Transition is an essential pillar of the United States, NATO, and international community’s long-term commitment to Afghanistan, and is a conditions-based process that is based on the assessment by a joint Afghan-international board that selected areas have achieved a level where they can effectively take charge of their own security. On March 22, 2011, President Karzai announced the first group of provinces and cities where primary security responsibility would be transferred from the international community to the Afghan National Security Forces. Afghan forces took the lead on security responsibilities in these areas in July 2011. A second group of provinces, cities, and districts for transition was announced in November 2011. With the completion of the first and second stages of transition, almost half the Afghan population will live in areas where primary security rests with the Afghan National Security Forces. By the end of 2014, it was intended that Afghan forces would have the lead for security across the entire country. Through 2014, the international community estimates that Afghanistan will require at least $9 billion a year to sustain current operations and fund development. It will take about $5 billion to cover the costs of the Afghan security forces at current levels and another $4 billion to support the Afghan budget and provide economic assistance. 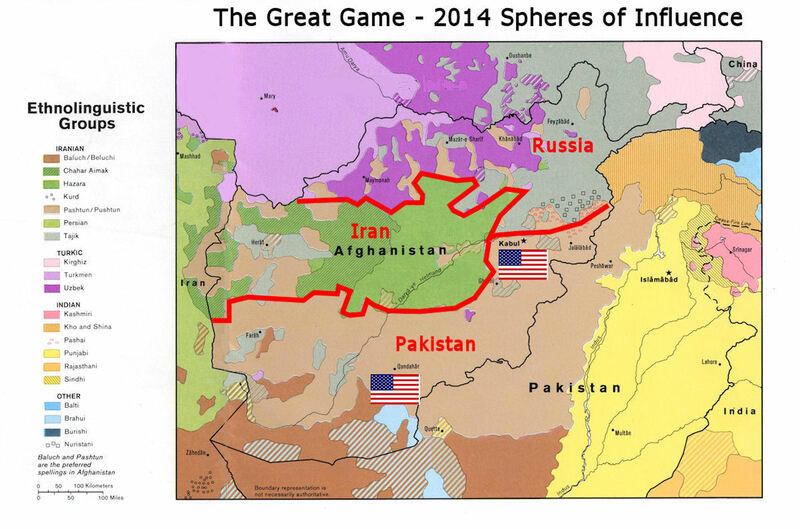 In early 2012 Afghanistan and the United States finalized a strategic partnership agreement outlining their relationship following the 2014 withdrawal of Western combat troops. The deal insures American military and financial support for the Afghan people for at least a decade beyond 2014, the deadline for most foreign combat forces to withdraw. Beyond 2014, the United States shall seek funds, on a yearly basis, to support the training,equipping, advising, and sustaining of the Afghan National Security Forces (ANSF). While the executive branch may seek such funds, it seems improbably that the US Congress will in fact appropriate funds for a country that America would rather forget entirely. The Afghan National Security Force, with a goal of 352,000 uniformed personnel (both Army and Police), is the eleventh largest Army in the world [Afghanistan is the world's tenth poorest country]. This force, bolstered by 130,000 NATO troops and another 10,000 American troops [as of 2012], was barely adequate to fight the Taliban to a draw. Budgetary constraints would cause the Afghan force be rapidly cut back starting around 2015 to 228,500, at which time any residual Western force would be not much more than a tenth the 2012 number. The implosion of Lon Nol's regime in Cambodia in 1975 would seem to be a plausible preview of the prognosis for Afghanistan. 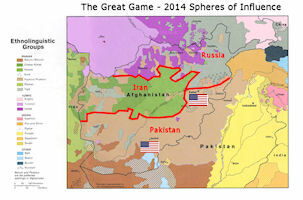 A surprise-free mid-term scenario for Afghanistan would include a Pakistani sphere of influence in the Pashtun South and East of the country, and Iranian sphere of influence in the northwestern part of the country dominated by Shia Hazara and Chahar Aimak, and a Russian sphere of influence in the northern part of the country with predominate Uzbek, Turkmen and Tadjik populations. Possibly the Americans would control airports at Kabul and Kandahar to support a residual counter-terrorist man-hunting presence by CIA and special operations units. Afghanistan is one of the poorest and least educated countries in the world. After three decades of armed conflict in Afghanistan, socio-economic conditions are deteriorated and the basic infrastructure is completely destroyed. Its conflict ridden history, which has global ramifications, makes it a special case in national development. Here human poverty is a multidimensional problem. It includes inequality in access to productive assets and social services, health, education and nutrition status, weak social protection system, vulnerability to macro and micro level risks – natural as well as human triggered, human displacement, gender inequalities and political marginalization. Afghanistan has one of the highest mortality rates in the world: one in five children dies before the age of five and one out of every eight Afghan women die from causes related to pregnancy and childbirth each year. Life expectancy is 49 years for both men and women. While these statistics are tragic, there has been progress. Recent reports indicate that 85% of the population has access to basic health services within 1 hour of travel to a health facility (68% for those on foot)--up from 9% in 2002. More than 1,650 professional midwives are employed by the ministry of public health, providing health care and childbirth services across Afghanistan. This has helped reduce infant mortality rates, and child mortality has also fallen since 2002. Afghanistan has made impressive advances in increasing basic education. More than 10,000 schools are providing education services to over 7 million children, a more than six-fold enrollment growth since 2001. During the Taliban regime no girls were registered in schools. Today, 37% of the student population is girls. Similarly, the number of teachers has increased seven-fold to 142,500, of whom nearly 40,000 are women. The international standard for functional literacy is known as Level 3. People at Level 1 can read and write single words; count to 1,000; add and subtract whole numbers, while those at Level 2 can read and write sentences, multiply and divide numbers, identify units of measurement. Level 3 is defined as the ability to “identify, understand, interpret, create, communicate, compute and use printed and written materials associated with varying contexts”. At levels 1 and 2, individuals are classified as functionally illiterate. As of early 2012 there were about 11,000 Afghan National Army personnel at Level 3 literacy [out of 188,000 total] and some 16,000 ANP personnel at Level 3 [out of 145,000 total]. UNESCO estimates that only 51.9 percent of Afghan men over the age of 15 and a mere 21.9 percent of women in the same age group can read and write. In 2008 it was estimated that the overall literacy rate was 28.1% (male 43%, female 12%). The real figures must be much lower, given the Army and Police numbers, and the breakdown of education system and flight of educated Afghans during 3 decades of war and instability. With functional literacy rates of no better than 10% in the Policy and 6% in the Army, these numbers must represent the number who know their ABCs, not the number that can write sentences. Adult literacy activities increased rapidly in 2009. Learning centers grew from 1,100 to 6,865, and activities expanded from 9 to 20 provinces, bringing literacy and financial services to over 169,000 beneficiaries (62% female). Ongoing support of literacy and basic education is paramount, as well as the quality and preparation of teachers in order to close the literacy gap left by 30 years of conflict. For several thousand years, known by several different names, Afghanistan was a region of central Asia, not a country. In recent times, Afghanistan has rarely had a strong central government. Generally, it was only during the “Golden Era” of Afghanistan, under King Zahir Shah and his father (1929-1974), that Afghanistan had a functioning central government that controlled the country. After over twenty years of civil war, there remains a strong sense among the main groups -- southern-based Pashtuns and northern groups including Tajiks and Uzbeks -- that regional interests come second to a pan-Afghan identity. Afghanistan remains an unstable place, where Al Qaeda loyalists continue to launch attacks against government forces, and officials in Kabul struggle to curtail the influence of regional warlords. Security remained the main concern, as government attempts to build security capacity flagged. The country's population is almost entirely Muslim. Non-Muslim minority groups, particularly Christian, Hindu, and Sikh groups, are targets of discrimination and persecution. Conversion from Islam was understood by Shia and Sunni Islamic clergy, as well as many citizens, to contravene the tenets of Islam. Within the Muslim population, relations among the different sects continued to be difficult. Historically the minority Shia community has faced discrimination from the majority Sunni population. This discrimination continues. Local Hindu and Sikh populations, although allowed to practice their religion publicly, continued to encounter problems. Most Afghans see the present government as corrupt and ineffective at every level. Corruption continues to be a significant impediment to reconstruction efforts, and progress in Afghan investigations and prosecutions of corrupt officials remained stagnant. The United States and the international community have developed a number of programs and committees to help officials counter government corruption. These efforts continue to face a fair amount of resistance from some high-level officials. Except in areas above 2000 metres, malaria is prevalent in Afghanistan, particularly between April and September, Chloroquine-resistant strains are prevalent in some areas. Other insect-borne diseases (such as leishmaniasis) are common. Water-borne, food-borne, parasitic and other infectious diseases (including cholera, typhoid, hepatitis, measles, tuberculosis, leptospirosis, pertussis and rabies) are prevalent, with more serious outbreaks occurring from time to time. Poliovirus (Poliomyelitis) remains endemic in Afghanistan. In May 2015 the WHO reiterated its 2014 assessment that wild poliovirus was a “public health emergency of international concern”. Afghanistan produces 90 percent of the world's opium, and the United Nations says as much as 15 percent of Afghanistan's Gross Domestic Product comes from the drug trade.